We offer patients the perfect balance of lightweight comfort, premium performance and simplicity. Very Light weight and is comprised of only four parts, making it intuitive, quick to set up and simple for patients to clean and reassemble. It offers more frame and cushion width, a shallower cushion and shorter frame length to comfortably seal against flatter nasal bridges. Dual-wall cushion provides even pressure distribution with extra softness at the nasal bridge, reducing common discomfort in the sensitive area. The slender and lightweight frame gives patients a stable fit. Hand Stitched headgear is flexible and breathable for patient, improving comfort and support. With its contoured edges, it's designed to be kind to the face. The Nuance Nuance Pro Nasal Pillow CPAP Masks with Gel Nasal Pillows are the first of a kind in nasal pillow masks. By using the gel technology Respironics pioneered in a lightweight and minimal nasal pillow design they offer a new dimension in comfort and seal. The gel nasal pillows fit two frame designs, offering a choice of a fabric or silicone frame. The Nuance Pro uses a clear silicone frame with gel pads to cushion the cheeks. The Nuance uses a soft cloth mask frame for lightweight comfort. Both come with all three sizes of gel nasal pillow. This is a nasal pillow CPAP mask and covers only the nares or nostrils, delivering air directly to the nasal cavity. The gel nasal pillow from Respironics, the industry leader in gel mask technology, is designed to comfortably seal at the opening of the nose to deliver the therapy pressure. The gel ring is very soft and flexible to conform to the shape of the nose. All three sizes of the gel nasal pillow come packaged with both models of the Nuance letting the user select the optimal size for fit and seal. To extend the life of the mask, replacement pillows are available for purchase. Respironics offers the gel nasal pillow on two different frame formats allowing the user to choose. 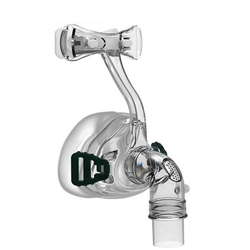 The headgear for each frame format is designed to support the gel nasal pillow seal. Select the Nuance or Nuance Pro when ordering to the get the desired frame and headgear. Read below for more information about the differences between the two options. 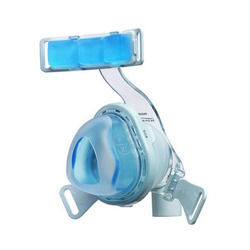 The Wisp Nasal CPAP Mask by Respironics was developed to offer comfort and ease of use while fitting a wide range of users. The first to offer options in headgear materials, the Wisp steps up to a new level of individual choice. Never losing site of the fact that mask comfort promotes successful therapy, the design of the Wisp is lightweight with minimal facial contact. The unique frame of the Wisp is offered in two formats - Clear Silicone or Fabric. The molded silicone is lightweight and flexible with smooth surfaces. For a different feel, select the fabric covered frame. Extending yet another choice, each side of the fabric frame has different material for different feels. The modular frames are interchangeable and reversible. The Wisp cushion is small and lightweight with a minimum of silicone touching the face. Three sizes of cushions are included with the Wisp, sizes Petite; Small / Medium and Large. The mask comes packaged with the size Small/Medium cushion in place and can easily be changed with the Large or XL cushion. Also available as a separate item is size Size Petite Cushion for Wisp. The headgear and frame design is the source of support and seal for the Wisp omitting the need for a forehead support. Having nothing on the forehead makes for a more comfortable therapy experience. People who enjoy watching TV or reading before going to sleep will appreciate the clear field of view. The lightweight and flexible short tube included with the Wisp connects to the swivel elbow. It serves as the connection between the long hose and the cushion - allowing for movement without losing the seal. The tube can be disconnected from the elbow for cleaning. Offering choice of hose position, the short tube can be secured to the headgear using the crown loop keeping the hose up and out of the way. 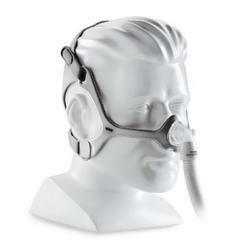 This product, Wisp Nasal CPAP Mask with Headgear - Fit Pack comes packaged with a size Original headgear. In order to conform to your face, the True Blue incorporates a flexible spring connecting the mask frame to the cushion. This reduces pressure on the bridge of the nose and compensates for movement while asleep. The gel cushion molds to the shape of your nose, providing a comfortable, self-adjusting seal. The True Blue is designed to fit loosely on the face. It is not necessary to over tighten the straps to create a seal. 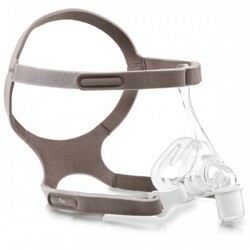 Simply position the mask and adjust the straps so the mask rests comfortably on your face. The loose fit allows the outer cushion silicone flap to inflate and create a seal around your nose. For help achieving a seal, put on the True Blue mask and connect it to your CPAP hose. Turn on your CPAP machine. While your machine is blowing, pull your mask out away from your nose, allowing the outer cushion flap to inflate around your nose. Slowly bring the mask back to its original position. 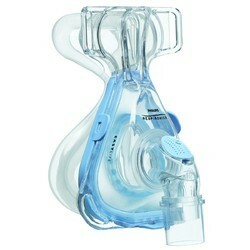 Please see Respironics' mask guide for more information. The Easy Life mask comes with a new cushion system that is a self-sealing design, using an outer cushion for support and inner cushion to achieve the seal. A single cushion clip holds the Auto Seal system to the frame and forehead, allowing the entire cushion to automatically adjust and seal. The Pico Nasal Mask: Minimal contact with the face and offers simplicity, comfort and seal. The Pico is currently the smallest profile of nasal masks on the market while delivering a combination of comfort and performance. Its minimally invasive design and superior seal delivers comfort and performance similar to nasal pillow masks. •Lightest and smallest profile of traditional masks on the market. •Only 5 parts making it easy to assemble or disassemble. •Comfortably fits 98% of clients. •Pico cushion provides similar comfort and performance of the proven Wisp cushion. The Dream Wear Nasal CPAP Mask with Headgear - Fit Pack (All Cushions Included with Medium Frame) is a minimal contact mask designed to help accommodate users of multiple sleeping positions. This is a nasal mask that delivers therapy by covering both nostrils.